Minamata in Japan and Bhopal in India. Two of the worst cases of chemical disaster to have hit the world this century. Years later, the nightmares continue for their victims and survivors. Two stories of compensation delayed, denied or only partially fulfilled. Why is the state of affairs so dismal even in a nation like Japan which prides itself on its progress? Is it because the whole exercise of granting compensation has its bottlenecks? Or are we, as Asians, plain lax? japan had woken up to the Minamata disease way back in 1956, signalling the beginning of one of the worst pollution cases to have hit it in the post-World War ii era. In 1995, a 40-year-old saga of bureaucratic evasion, corporate high-handedness and judicial foot-dragging finally reached its culmination. The then Premier Tomichii Murayama's public apology (for the lethargic governmental response in dealing with the victims) and the announcement of a so-called final settlement capped an arduous and agonising search for justice by victims of the disease. The disease was officially recognised as afflicting people who had consumed mercury-contaminated fish and other marine products taken from the Minamata Bay in Kumamoto prefecture. The finger of blame pointed to the local chemical giant, Chisso Corporation, which for 12 years had callously dumped mercury into the waters of the bay. And this was not a mere flash in the pan. Minamata disease resurfaced in 1965 in Niigata along the lower reaches of the Agano river, where another chemical manufacturer, Showa Denko, had discharged mercury compounds. Today, worn out by the long struggle with the two corporations and the Japanese government, most groups of victims have accepted the 1995 proposals. With the average age of the victims approaching 70, they do not have a choice. Initially, of the 25,000 plaintiffs who had filed suits, only about 2,260 (of the more than than 17,000 Chisso cases) and 690 (of the 2,000 Niigata cases) were officially recognised and awarded compensation. In a highly belated move in January 1995, the Japanese cabinet announced the appointment of judgement examination committees to determine the eligibility for compensation of victims according to diagnostic records prepared by hospitals. Consequently, approximately 10,000 victims are due to receive compensation now. Many have already received it, while the rest are under investigation (medical) by the local governments. Though the 1995 package was construed as a victory for the victims, many activists in Japan were displeased with the meagre us $25,000 compensation. Today, each claimant is presumably receiving a total compensation of 4,000,000 (app us $1,320,000). Compared with the average Japanese worker's monthly income (567,000 or us $187,110), the compensation amount is very low. According to Tankanori Goto, a lawyer for the patients' group Kanja Dome, the redress was really a guise for a politically motivated out-of-court settlement. Goto's other grouse was that issues like rehabilitation of victims and reconstruction of damaged areas were yet to be settled. Another question was raised by commentators: Will the polluter really pay for the environmental havoc unleashed in Kumamoto? The facts said otherwise -- the Central and the Kumamoto prefectural governments had earmarked a total of us $246 million to bail out the financially straitened Chisso. Moreover, many did not lend much credence to Murayama's apology; there had been six district court rulings over the past four decades, three of which had pinpointed responsibility on the government. The government had appealed these court rulings. Why was justice denied for so long? Behind the answer lies an amazing story of denial, cover-ups and a cosy collusion between Chisso and the government. The long conspiracy of silence that surrounded Chisso's reckless dumping of mercury was rooted in the company's formidable clout, which went back to its wartime nexus with the military and the government. 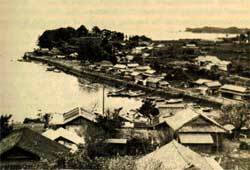 The company's improving fortunes had led to a corresponding dramatic transformation of the village of Minamata into a bustling city. Since the economic prosperity of the city depended on the Chisso plant, the inhabitants felt themselves closely linked to the corporation. This economic prosperity accompanied massive damage of the environment. In the 1950s, as reaction catalysts, the company had used large amounts of mercury compounds. The production wastes were dumped untreated into Minamata Bay with disastrous results: the number of dead fish in the water increased and fish catches declined. Protests from local fisherfolk were smothered by Chisso by bestowing small sums as compensation. Around the same period a mysterious phenomenon surfaced in which cats living in the city would go through a frenzied dance and ultimately throw themselves into the bay. In May 1956, four patients suffering from severe convulsions, unconsciousness, lapses into crazed mental states, and then permanent coma (resulting in death), were brought to the Minamata city hospital. And these were not the only cases. It was found that 17 patients with the same symptoms had died in fishing villages surrounding Minamata city. Studies into the disease were carried out by Hajime Hosokawa, director of the Minamata city hospital, and a medical research group of Kumamoto University in Kyushu. These studies revealed that (a) all the patients had consumed large amounts of fish from Minamata Bay and (b) links were evident between the disease and the Chisso-Minamata complex; laboratory animals which had been fed the poisonous fishery products developed toxic symptoms. Chisso immediately launched on a massive cover-up attempt, while the government maintained a studied silence. In 1959, in a serious blow to efforts to uncover the cause of the disease, governmental funding for the Kumamoto University research group was cut off. Similarly, Hosokawa was ordered by Chisso to keep silent about his findings. As a result of the criticism directed against its organic mercury cause-and-effect theory, Kumamoto University, which became the centre for examining patients, turned defensive. Its medical team recognised only the specific symptoms of methyl mercury described by researchers D Hunter and D S Russell: concentric constriction of visual field, loss of coordinated movement and of sensation. Though Hunter and Russell had also observed more non-specific symptoms such as loss of hearing, mental disorder or diabetes, these were not taken into account. 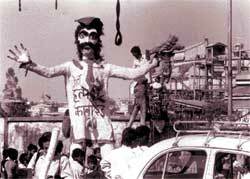 From July 1959 onwards, Chisso was faced with a flood of protests from local fisherfolk's groups. When the Minamata Fishermen's Association and the Fushimi Sea Fisher-men's Association demanded compensation from the company, their demand was turned down on the ground that the cause of the disease was not understood to be related to the operation of the chemical complex. By 1968, Chisso had lost its technological edge and become a second-class enterprise. Fearful for the future of the city, its citizens rooted for the pollution case to be solved without friction and with lesser financial burden on the company. The victims who were demanding negotiations for reparation, therefore, became an isolated minority. The company took the easy way out by opting for third party negotiations through the national or prefectural government. This led to a split in the patients' groups between those who signed a white paper proxy that required compliance with the conclusions reached by the mediation commmittee, the so called 'trust' group, and the 'lawsuit' group which geared up to take its case to court. When the Niigata and Minamata cases finally made it to the courts in 1967 and 1969 respectively, it was an uphill task all the way for the victims. This was the first time that an environmental destruction case had gone to court in the post-World War ii period. Since there were no laws regulating industrial activity in Japan, there were no precedents on which the victims could base their case. In the end, it was the tenacity and courage of a few individuals and citizen's groups that brought the Minamata case nearer a solution. Among them were the Minamata Disease Research Group and Teruo Kawamoto, a fisherperson victim. Kawamoto had a strong reason to fight for justice. Afflicted with symptoms of mercury poisoning himself and having watched his father die in agony, he was convinced that his father's symptoms were of Minamata disease. Since the medical diagnosis team did not recognise his request to study his father's body by autopsy, he enlisted the support of the Minamata Disease Research Group. The latter countered with detailed samples and analyses which proved beyond doubt that thorough medical examination in the Kawamoto cases would facilitate their designation as Minamata disease victims. In 1971, Kawamoto and a few other Minamata disease victims took matters in their own hands; since Chisso's president would not talk to them, they began a sit-down strike. The movement was supported by students' groups. As the patients' movement gathered momentum, various underhand tactics employed by the company came to light. In a major blow to the credibility of the government negotiating committee, the direct negotiation group discovered that some of the proxies presented to the former had been forged. The turning point in the Minamata saga were the civil court victories in the Niigata (1971) and Minamata (1973) cases. In the former case, the victims were granted between 1-10 million (us $33,000-$330,000), but this was increased to 18 million by direct negotiations with Showa Denko. Similarly, there was a difference between the court decision and company compensation in the Minamata case. The former was only for minority claimants. By direct negotiation, compensation and medical costs were paid to all designated patients. Timely action by the Japanese government could have prevented the Minamata disaster from assuming such huge proportions. If some us $5,000 had been spent to recover mercury, more than us $1 billion in compensation would not have been necessary. Other steps the government could have taken to keep the situation under control: a ban on fishing in the early stages so that the number of victims would be much smaller and an early halt to the discharge of toxic waste. As it turned out, it was only in 1968 that the local and Central government authorities mustered the political will to prevent Chisso from dumping mercury. Similarly, greater decentralisation at the local level and more impetus in the patients' movement would have made for a faster solution. Epitomising the despair of the Minamata victims at the height of the struggle against Chisso, Kawamoto once said: "Because there was no Minamata patients' movement, and because the said patients are weak, the truth about the Minamata disease is still unknown." Justice delayed may be better than no justice at all, but when it comes with a tag of a meagre us $25,000, it only adds insult to injury for the victims. twelve years after the devastating Bhopal gas tragedy, the 600,000 people affected by it are the hapless victims of another human crime: callousness. Callousness perpetrated by their very own Indian government. Callousness which manifests itself in its tardy method of carrying out medical tests for awarding compensation. In the time taken to award the compensation. In making appropriate medical facilities available to the gas-affected. In preventing release of information of epidemiological studies carried out on the affected population. In February 1989, the Government of India had let Union Carbide Corporation (ucc) off the hook by accepting a measly compensation of us $470 million instead of the us $3 billion which it had demanded.Besides its other displays of apathy, the government also chose to ignore recommendations of the International Medical Commission on Bhopal (imcb) that what was needed was not hospital-based treatment, but out-patient care. Instead, it has pressed on with a 500-bed hospital being constructed on a Supreme Court (sc) directive. The official response to criticism is the usual. "The people have been and are being paid compensation. There are sufficient medical facilities close to their homes," states a casual Tanwant Singh Keer, the Madhya Pradesh minister for gas relief. "A hi-tech hospital, whose facilities would match the best in the country, would be a boon for entire central India, and not just the gas-affected," he adds. The gas-affected disagree. For them, this hospital, 10 km from the ucc factory, is too far away for the daily-wage earners, who constitute a majority of the severely affected people. While most compensation claimants received a one-time compensation, epidemiological studies carried out by the Indian Council of Medical Research (icmr) in 1987-91 reveal that morbidity rates of the gas-affected was on the rise. Among the affected, deaths due to respiratory causes was 42.46 per cent as compared to the national average of 20 per cent. Abortion rates were higher among women in the gas-affected areas. Almost 50 per cent infant deaths were due to respiratory complications. Instances of chromosomal aberrations were also evident. "The personal injury evaluation (pie) carried out by the directorate of claims for medical categorisation of the gas-affected five years after the leak, has been questionable and unscientific," says Sainath Sarangi of the Bhopal Group for Information and Action (bgia). He sites independent medical studies carried out by New Delhi's Jawaharlal Nehru University (jnu), which indicated that around 60 per cent of the claimants required the pulmonary function test (pet) and exercise tolerance test (ett) to have proper medical evidence of damage caused to the gas-affected. But only 15 per cent and two per cent actually underwent the pet and ett, respectively. According to categorisation figures presented by the directorate of claims, only eight per cent of the 597,306 claimants who had been medically examined, suffered serious injury as a result of the gas leak. Forty-three per cent were reported to have suffered no injuries and only a ridiculous 40 persons were found to have suffered total disability! The icmr studies, however, indicate that almost 80,000 people suffered eye injuries, which were permanent in nature. The process of pie depended on an arbitrary scoring which converted symptoms and signs, treatment and investigation findings into numbers. There was no attempt to find out and diagnose the disease from which the claimant suffered, rendering previous medical records, from immediately after the gas leak, useless. According to guidelines specified by the directorate of claims, a claimant would be categorised 'permanently injured', only if the score was more than that in the immediate post-exposure period. This implied that unless the claimant's health was worse at the time of assessment (conducted five years after the gas leak), they would be labelled 'temporarily injured'. "The pie was based on very few investigations. As ucc had suppressed all toxicological data in a bid to underplay the damage caused by the toxic gases, we just do not have adequate information to assess the damage to the human body," notes the jnu study carried out by Nishith Vohra and Satyamala. Their observation only lends credence to the assumption that detailed tests needed to be done for most claimants. Dozen years after the leak, medical care for survivors remains the same. In absence of information on the nature of gases that escaped that merciless December night, doctors continue to indiscriminately prescribe antibiotics, steroids and psychotropic drugs which provide temporary relief. "The resistance of the gas-affected reduces with time. The damage caused was permanent and that cannot improve. Drugs can only provide immediate relief," says K K Thassu, chief medical officer, gas relief. He, however, adds that there was no irrational dispensation of drugs. Says D S Jain, registrar, office of the welfare commissioner, "The medical categorisation depended on the documentation provided by different medical practitioners, who examined the gas-affected. Thus, the categorisation varied from doctor to doctor." Sarangi says that the sc unfortunately left out directions towards complete registration of claimants, proper assessment of injuries and determination of adequate compensation. A comparison of compensations provides interesting insights. The sum of us $470 million was considered adequate for Bhopal's 5,97,306 claimants, which entitled every claimant to us $786.87. In a 1985 case in the us, where there were 60,000 claimants against the Johns Manville asbestos company's polluting ways, the compensation amount was us $2.5 billion, with each claimant receiving us $41,666.67. And this case did not involve a disaster, but was a one of harmful effects emanating from a source of non-obvious danger. The bgia points out that next of kin of those killed in the Kanishka mid-air explosion (1985) were paid Rs 1,000,000 (1 million) each; the lives of the affected in the gas leak have been priced at least 10 times lesser than their fellow citizens. In Bhopal, the average payment for the 14,775 death claim cases which were disposed, was between Rs 27,865-just over Rs 1 lakh. From this was deducted the interim relief paid to claimants. The government offered no interest on the compensation payment, while reportedly amassing Rs 44 lakh a day as interest itself. Established norms in tort cases say that claimants are entitled to interest on compensation from the date of registration of claim till that of its resolution. "If the government had paid interest on the compensation, the amounts paid would have been realistic, keeping in mind the suffering the gas effected people underwent, the loss of earning capacity, and the medical expenses they had incurred," says Abdul Jabbar, convenor of the Bhopal Gas Peedith Mahila Sangharsh Sangathan, an organisation fighting for the cause of those affected. The government's denial of compensation to those who were below 18 years of age at the time of the disaster has drawn much flak; there were 1,50,000 such claimants at the time of the leak. The logic offered by the government was that as they were minors and hence did not own property, they could not claim compensation. Equally criminal was the lack of foresight in keeping in mind those infants who were born to gas-affected women. "The effects of the gas can last for upto three generations," states M P Dwivedi, former director of the Bhopal Gas Disaster Research Centre. icmr studies have reported that physical and mental growths of such children have been significantly affected. The style of functioning of the welfare commissioner's office also invites criticism. Says Ranjit Kumar, member of committee oppointed by the sc in 1995 to look into the issue of compensation procedures, "We noted that the welfare commissioner's office took suo moto action in all cases regardless whether a case merited revision or not." Indifference and injustice: these terms describe the official handling of the aftermath best. Even the practice of conducting lok adalats, begun in 1995 to cope with the problems of delays in compensation, has had its share of controversies. The welfare commissioner was forced to revise all cases awarded on one occasion, after it came to light that the presiding judicial officer had alloted only two minutes per hearing. Today, most of Bhopal's survivors share the resigned attitude of Hamida Bi, who is one of them: " Humey to Allah Mian ne bachaya. Woh sabse badi baat hay (God saved us that day. That is what is most important)."